What’s the status of my iTunes Season Pass? The Writers Guild of America ended its three-month-old strike earlier this week, meaning that many of your favorite TV shows could soon find their way back onto the airwaves. And it also means that iTunes Store users who take advantage of the online store’s Season Pass feature may soon get some clarity on the status of their subscriptions. As you probably know, the iTunes Store offers a Season Pass option for many of the television programs you can buy from the online store. So instead of paying $1.99 for each individual episode of a show every week, you pay a single fee up front—the amount varies depending on the program—and the shows automatically download to iTunes a day after they’ve aired on TV. A fan of Prison Break, for example, would plunk down $39.99 at the start of the TV season and know that, every Tuesday, there will be a download of Wentworth Miller’s latest misadventures waiting for them. It’s a convenient way to make sure you never miss an episode of your favorite show while also getting a steady stream of digital content delivered to your Mac… unless, of course, there’s prolonged dispute between writers and Hollywood producers smack dab in the middle of the TV season that wipes almost all scripted programming off the air. But what are the odds of that happening? iTunes Season Pass subscribers began feeling the squeeze last month, as we reported then, when the stockpile of programming filmed prior to the writers’ walkout began to dry up with no future episodes in sight. And so, subscribers found themselves in a state of limbo, having paid for a full season of shows but receiving only a fraction of that amount—with no indication of whether programming would resume in the foreseeable future. When we ran that story, our reporter contacted Apple multiple times for a comment on what the company’s policy would be toward Season Pass subscriptions affected by the strike. Apple didn’t respond, which is somewhat understandable given how in flux the situation was—from the company’s perspective, it probably didn’t make sense to comment definitively on what it would do in the event of a truncated season when it was unclear how long the strike might last and what its impact might be. Well, now that the strike is over, TV networks have begun formulating a game plan on how to restart the TV season—which shows will be coming back to the airwaves, when they’ll return, and how many episodes we can expect. TV Guide has set up an updated list of the networks’ programming plans, showing when certain TV programs will return and how long their seasons will last? How will this affect shows with Season Pass options available at iTunes? To find out, I went through TV Guide’s list and compared it to the Season Pass information available on iTunes. The chart below lists how much subscribers paid for each shows’ Season Pass, how many episodes they’ve received so far, and how many they can expect to appear in the coming months. Episodes available on iTunes were as of February 14. 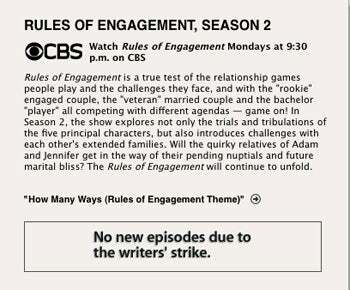 * denotes episodes completed pre-strike that are yet to air. ** denotes 4 pre-strike episodes but does not include four additional episodes scheduled to be shot but uncertain as to whether they’ll air. ^ denotes a combination of pre-strike episodes and episodes still to be shot. In a few cases, the strike will have a minimal impact on Season Pass subscribers, with the total number of episodes approaching the 23 or 24 that typically make up a full season. Subscribers to CSI: Miami for example have already gotten 13 episodes as part of their Season Pass; with CBS promising eight more installments of David Caruso removing his sunglasses to fire off some forced pun about a horribly graphic murder, that’s 21 episodes when all is said and done. In other cases, the shortfall in episodes looks to be far more substantial. Fox plans to air the Prison Break season finale next week. That’ll end the season at 13 episodes, and Season Pass subscribers who shelled out $39.99 last fall expecting 23 episodes might feel a wee bit short-changed. So will holders of a Season Pass for The Unit, which appears to be finished with its season at 11 episodes—not exactly a lot of bang for $39.99. So the question we asked in January lingers: How does Apple plan to handle the issue of Season Passes cut short by the writers strike? Store credit applied to future Season Passes? And what if the show doesn’t return to the airwaves at all? Would a general store credit be issued? Or nothing at all? The writers have settled their contract dispute, and the TV networks have begun to make their plans know. Now it’s Apple’s turn.